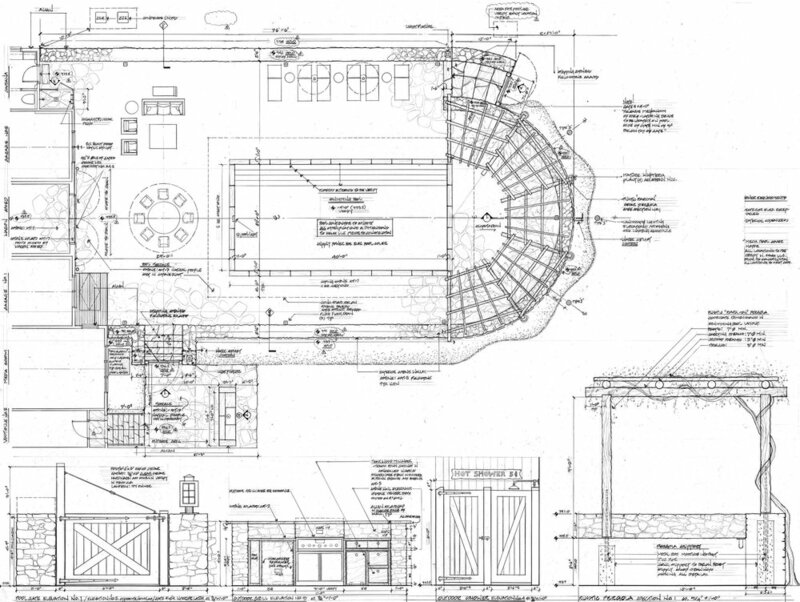 As architects, we use the language of drawings to translate our clients’ dreams into reality. At each step of the process, drawings are essential in conveying the design concept to clients, consultants and contractors. Here are a few examples of the types of drawings used to illustrate the design, from the initial conceptual sketch to the most precise construction document. The initial sketch, often done on a scap of paper or even a napkin, illustrates the essence of the design concept. This is a very quick, organic seed of an idea set to paper. Although it may be just a few scratchy lines, it captures the essence of the design. This inital sketch for a hilltop tower house shows the very early thought process. The site plan looks at the project from the very broadest view, as if seen from far above. The site plan is a valuable tool in creating a master plan for a property. In developing a site plan, environmental factors such as wetlands, topography, major trees, views and sun exposure are all addressed. This drawing illustrates the placement of the house, outbuildings and major landscape features such as swimming pools, tennis courts, terraces, arbors, orchards and gardens. We use the site plan to study the spacial connections between all these elements which in themselves become design opportunities. The undulating dotted lines of this site plan convey the rolling contours of the land. The cottage is sited at the highest of these contours to capture distant ocean views. 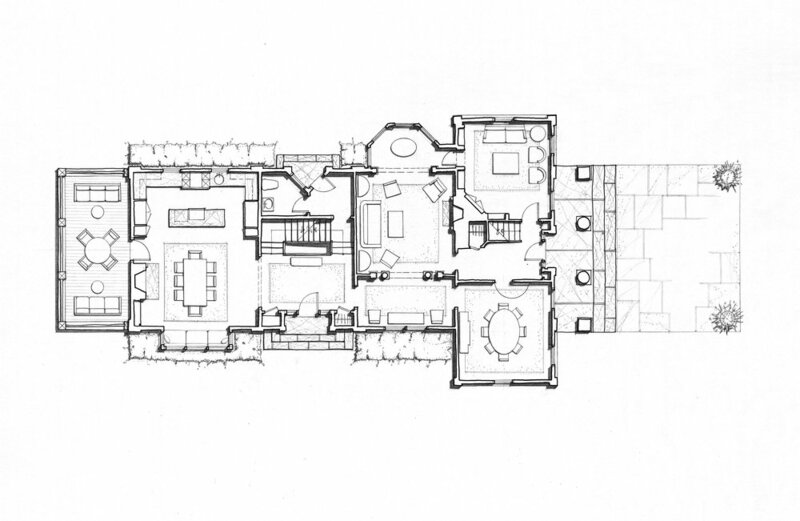 The site plan of this expanded Georgian home illustrates the relationships between the house and the entrance courtyard, swimming pool, terrace and formal garden. The site plan of this 300 acre farm was carefully designed to highlight the diverse environments of the property, creating a winding approach drive to the hilltop house site. Perspective sketches are used to explain the three-dimensional quality of a building or site. This series of simple perspective sketches illustrates the sequence of experiences on the winding entry drive of the site plan above. The floor plan illustrates the two-dimensional shape of the architecture and the flow between rooms, spaces and exterior elements. We always show furniture in our floor plans to add scale to the drawings and to help the client to envision the spaces. The red walls and deep shadows help to bring this beach cottage plan to life. The plan of this expanded Greek Revival house shows the relationship between the original house and the new wing to the left. The plan of this country retreat shows the relationship between interior spaces and exterior amenities. The elevation is the face of the building; the first impression that foreshadows what is waiting within. It reveals the overall massing, roof profile, arrangement of windows and materials. We often add shadows to our elevations to add three-dimensionality. The active roofline and varied forms distinguish the elevation of this Anglo-inspired home. The rambling additions of this early cape are designed to cascade down the hillside from the original house. A glass observation tower distinguishes this carriage house / guest house. This rambling country home is designed to appear as if it evolved over generations. Section drawings illustrate the interior of buildings or landscape features, as if sliced through the center. These drawings are often helpful in explaining the relationships and profiles within a building. 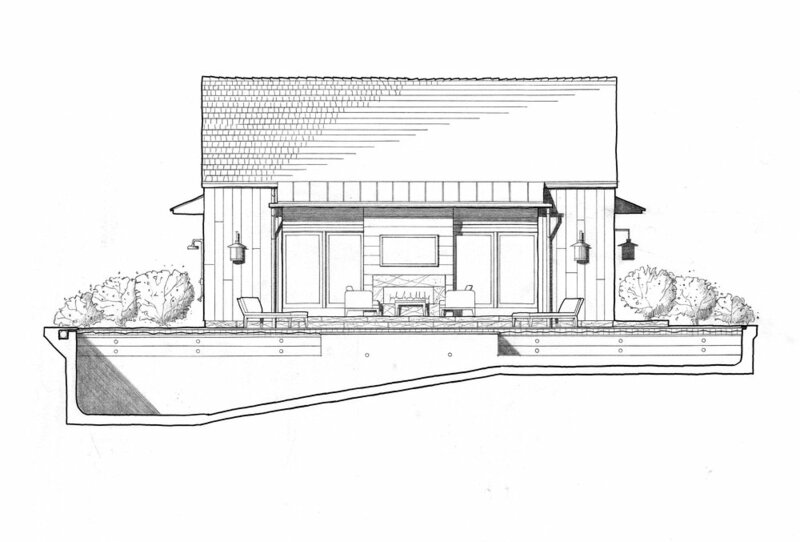 The swimming pool in this drawing is shown in section to illustrate the profile of its interior. The central fountain of this garden is shown in section to convey its profile and depth. This pool house section illustrates the varied ceiling profiles within the building. Once a design is approved, we create very detailed construction documents to insure that the contractor understands each aspect of the project and that it will be built exactly as conceived. 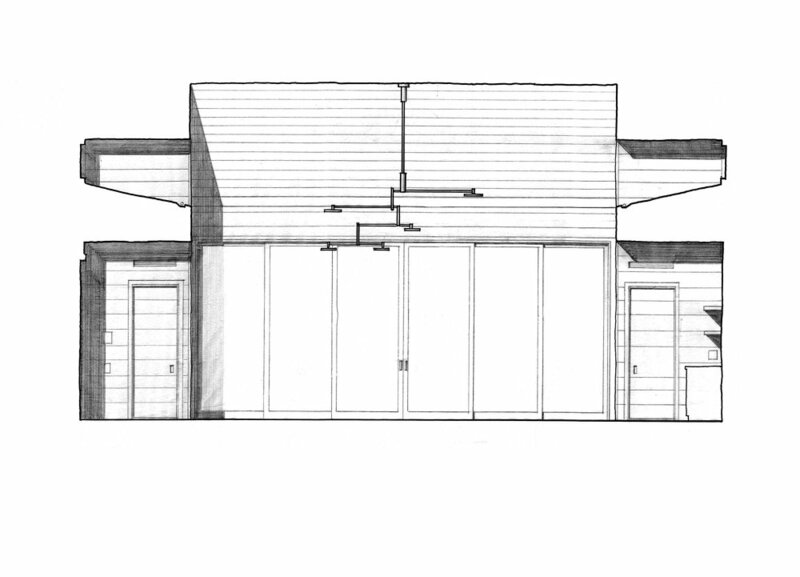 The few drawings below illustrate the level of detail and thought dedicated to these construction documents. This blueprint cover sheet illustrates the final front elevation of the home. This sheet details every aspect of a swimming pool complex including the pool enclosure, outdoor kitchen, exterior shower and rustic pergola. For the renovation of an historic Greek Revival home we took great care to design and document appropriate period style mantlepieces. This section shows the exterior profile of a cupola as well as a very detailed description of its construction. An axonometric drawing is a three-dimensional projection which helps the client and contractor to envision the final massing of the building. We often build a study model to further assist our clients in envisioning their home. This axonometric drawing illustrates the massing of the building as well as the structural design by consulting engineers DeStefano & Chamberlain. We created this study model as a design tool and means of explaining the building massing to both the client and the contractor. The elevations, axonometric drawing and study model all helped the client to envision their future home.